Imagine how useful it would be if we had little knobs, strings or keys in our backs, enabling us to instantly lengthen our hair from a short, everyday bob to long, flowing locks which would make even Rapunzel jealous. Lots of dolls have this useful feature; they don’t need sessions at the hairdressers for fiddly hair-extensions!Probably the most famous ‘grow hair’ doll was Palitoy’s Tressy, produced under licence from the American Character Doll company. When she burst into the advertising spotlight in 1964, the slogan, ‘But HOW does Tressy’s hair grow?’ was chanted in school playgrounds. In fact, it turned out to be a clever promotional campaign because little girls who weren’t in on the secret became upset, pestering their parents until they too had a Tressy. So, how did Tressy’s hair grow? Simply by pushing a button in her tummy to release the ‘magic strand’ which could then be gently pulled until her hair lengthened. Afterwards, the strand was wound back into the head by means of a small metal key inserted into the hole in her back. Later versions had a plastic key as a permanent fixture. Tressy stood 12″ tall and was a slim, teen-type doll, with painted sideways-glancing eyes, but was afterwards updated and given forward-looking eyes, jointed wrists and gripping hands. Her younger sister, Toots, also favoured growing hair. Palitoy seemed quite taken with the grow hair mechanism, and in 1974 produced 18″ Sheena, more sophisticated than Tressy, with glamorous clothes such as a sparkly lilac outfit with flared trousers and a matching long-line tunic. Sheena’s hands were beautiful with long expressive fingers, and her slogan was ‘Just like magic her hair grows’. Instead of a key she had a dial in her back to wind the hair, though she still had the button in her tummy to release the strand when it was pulled. 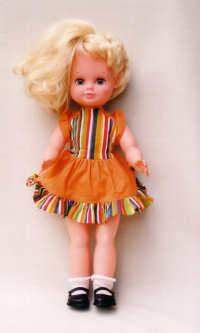 Yet another Palitoy doll was Goldilocks, a younger girl, rather than a teen, dating from 1968. Goldilocks wore a variety of outfits, and her hair was worked by a dial in her back, similar to Sheena’s. She was advertised as having 101 hair styles! Bradgate, a subsidiary company of Palitoy. issued Silky, a 10″ tall girl with a permanently fixed key, similar to Toots, Tressy’s sister. 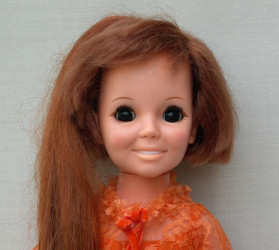 The American Ideal Toy Corporation produced a range of grow hair dolls, some of which were sold in Britain. Most popular was Crissy, a similar height to Sheena, who had striking large dark eyes. Crissy’s hair grew by gently easing out the main centre strand, and could be retracted by means of a pull-cord in her back. She was first made in 1968, and others in the series included Velvet, Mia, Kerry, Brandi and Cinnamon, all just as attractive. Haute Coiffure Sindy, dating from 1985, was a grow hair doll too. Made by Pedigree, she wore a beautiful pearlised strapless full-skirted dress over a lilac net petticoat, and a white fluffy jacket with three-quarter length sleeves. Sindy’s hairpiece was lengthened by carefully pulling it from a hole in the top of her head, and the idea was to style – or cut – the hair, which explains why so many of these dolls are found sheared! 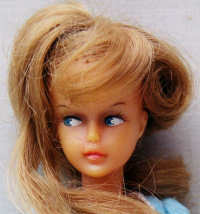 Replacement hair came in little plastic bags marked with the Sindy logo, and a panel in her back could be prised off, allowing the new hair to be inserted by means of a plastic ring tied to a thin string. Once the hair was fully extended it was virtually impossible to retract it, though sometimes, if you were lucky, the string attached to the plastic ring could be eased back slightly. One of the prettiest of these clever dolls was Katie, first issued in 1992 by Tonka, and made for a further couple of years by Kenner. Katie was the big sister of Tiny Tears and her blonde hair not only grew but could be changed from straight to wavy, depending on which hairpiece you chose to insert. This young girl doll was 17″ high, and her mechanism was activated by a plastic locket around her neck, attached to a pull cord. She is quite difficult to find today in perfect condition, and good examples sell for around £40. There were French versions of Katie, too, called ‘Kattie’, including a brunette version who seems to be fairly rare. 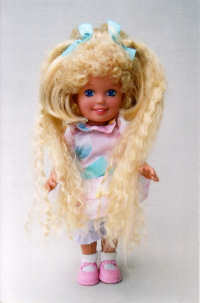 Still easy to find, however, is Playskool’s cheerful Dolly Surprise, a 10″ high smiling girl dating from 1988. She was obtainable with many variations of both facial features and hair styles. Eye colours, dimples and freckles varied, and some dolls even featured TWO growing tresses. The mechanism was worked by raising the doll’s right arm, causing the hair to lengthen with a whirring sound. Twisting her left arm let the thick wavy strand retract back into the head, clicking loudly as it went. This doll came dressed in many different styles including a pretty pink and silver ballet tutu, and extra outfits were available. There was also a larger, 15″ version, a chubby faced baby, with a similar mechanism. Bride Surprise, from the Hasbro/Kenner/Tonka group, was a creative hair grow doll from the 1990s, a 14″ beauty whose hair cascaded down to her toes when her arm was raised. Amazingly, as it erupted, it turned from blonde to vivid pink! She had plenty of other unusual features, including a dress which turned from short to long by means of attached ribbons, a bag which changed into a bouquet and a secret gift hidden inside a rose fixed to her hair. Other grow-hair dolls which surface from time to time include a winsome-faced soft-bodied girl from Gotz, mini-sized ‘Kim’ dolls from Uneeda (with the mechanism worked by a cord in the foot), various Barbies, a range of ‘Haircut Magic’ Cabbage Patch dolls, Pedigree ‘Cut and Grow’ girl dolls with yarn hair and ‘Pert and Pretty’ by Horsman. There are many others. However, the prize for the most unusual of these dolls must surely go to Kenner’s 9″ tall Hair-Do Dolly. She had painted features, her clothes were made of plastic – and her hair was made from Play-Doh! Cleverly, the top of her head lifted off, so the Play-Doh could be inserted, and then, after replacing it and turning the doll’s right arm, the strands of clay squidged out through various holes in the top of her head. If a realistic colour clay, such as yellow, was used, it resembled thick strands of hair as it emerged. She came with other head tops, each with a different arrangement of holes, to enable various styles to be created and the clay could even be made to ooze out in two colours to provide highlights! Best of all, a pair of plastic scissors were provided so that she could be given a hair-cut, before filling her head once more with Play-Doh and beginning all over again. Hair-Do Dolly, introduced in 1991, must have given children hours of fun, but she is another who seems difficult to find today. Although the majority of the dolls mentioned are reasonably easy to source, finding them in acceptable condition is much more difficult, as they proved irresistible to budding hairdressers and so tend to have cut hairpieces. Not only do hair grow dolls make a great thematic collection, they are enormous fun to play with!